1 For your 66th Birthday i am sending you 66 hugs and 66 kisses and i wish you a really special day. 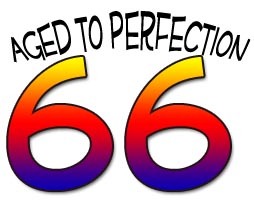 2 The 66th Birthday is the beginning of the 67th journey around the sun. Enjoy the ride and have fun. 3 Congratulations for your 66th birthday and it starts the countdown for retirement. 4 On your 66th birthday i am sending you all the best wishes, healthiness, success and may all your dreams come true. 5 I was going to send you something real cute on your 66th Birthday. It just did not want to fit into the envelope. All the best for your birthday. 6 All the best on your 66th birthday. Birthdays are good for us. The more birthday you are celebrating the older you are getting. 7 All the best wishes for your 66th birthday. I hope that all your dreams and wishes for the future come true. 9 I wish you a fantastic day with all your lovely family on your 66th Birthday. May all your wishes come true. Please vote for some of these happy 66th birthday congratulations so we can form a toplist of the best wishes and sayings.